Dyson's new 360 Eye robotic vacuum cleaner features track wheels and a robotic eye. Robotic vacuums don't exactly have the best reputation. They're easily confused and not particularly good at cleaning -- not exactly worth their $300 to $500 price tags. But Dyson says it has made a robotic vacuum cleaner that you'll want to consider. The Dyson 360 Eye features a 360-degree robotic eye that helps it navigate around the room, brushes that span nearly the entire width of the robot and caterpillar track wheels that help it move over obstacles. 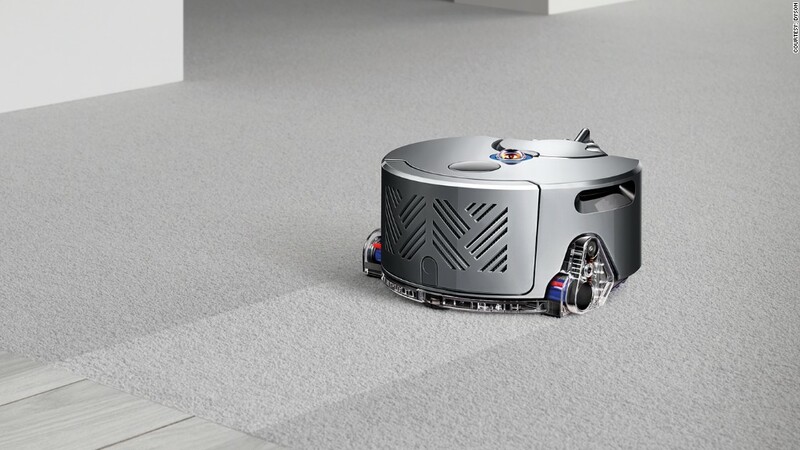 Dyson claims its robotic vacuum can pick up dirt better than any of the competition -- at least in the first pass. "Most robotic vacuum cleaners don't see their environment, have little suction, and don't clean properly," said James Dyson, the company's founder. "They are gimmicks. We've been developing ... a genuine labor saving device." Though Dyson claims that the field of robotic vacuums is sub-par, Consumer Reports actually liked the $450 iRobot Roomba 760, which picked up "every piece of paper, all the cereal and sand, and virtually all the rice" the testers laid down on for their review. The influential magazine also found that iRobot's (IRBT) Roomba was able to navigate out of tight spots and around extension cords. The Dyson 360 Eye will go on sale in Japan in the spring of 2015 before launching in other markets. The company has not yet announced a price.